Feb.4-- Mrs. June E. Allen Byrd age 61 of Vidalia, GA. June entered Eternal Rest on Thursday, January 31, 2019 at her residence in Vidalia, GA. June was born on January 22, 1958 to the parentage of the late Peyton Allen, Sr. and Ametta Lyles Allen. She was educated in the Public School System of Union County, NJ. While June mostly served as a homemaker she held various jobs during her life including Wake Vern, and the Marriott. After meeting her Husband Willie Sr. in 1977 they later relocated from New Jersey to Vidalia, Ga. June touched those around her with spunky personality and wit. She loved to read. She is preceded in death by her husband Willie Byrd, Sr. and Two Sisters Jean (Bill) Small, and Blanche Allen. She leaves to cherish her precious memories Two Sons: Robert L. Allen, Sr. (Charissa Harris) of Vidalia, GA, and Willie Byrd, Jr. (Hope Jenkins) of Beaufort, SC. Two Brothers: Peyton “Buzzy” (Elaine) Allen, Jr. of NJ, and Lindsey (Linda) Allen, Sr. of Mt. Vernon, GA. Two Sisters: Betty Allen of Indiana, and Jean (Milton) James. Grandchildren: Shakeem Lassiter, Arayah Byrd, Shyeem Byrd, Chinna Allen, Diamond Byrd, Robert Allen, Jr., Aveyon Byrd, Nyelle Byrd, Courtney Walker, LaQuintez Walker, Quadir Harris, Samir Harris, Samaria Harris, and Anthony Kent. Great Grandchildren: Cayden Freeman, and Camdyn Walker. A Special Friend: Loretta Hunter and a host of other loving relatives and friends. Public Visitation will be held on Monday, February 04, 2019 from 5 PM until 7 PM at Vincent R. Drummer Funeral Home in Vidalia, GA.
Funeral Service will be held on Tuesday, February 5, 2019 at 11 AM from the Sanctuary of Eureka Springfield Baptist Church in Higgston, GA. Rev. Roandle Day Pastor will deliver the eulogy. 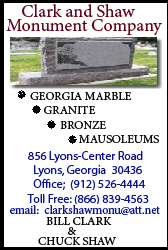 Interment will follow in Old Salem Cemetery in Longpond, GA.